Balance Awareness Week takes place every year during the month of September. This year Balance Awareness Week takes place from 14th-20th September and is organised by The Meniere’s Society. The aim of Balance Awareness Week is to raise awareness of dizziness, vestibular disorders and the work of the Meniere’s Society among those who suffer from these conditions. The awareness week helps the Meniere’s Society get in touch with GPs, consultants, hearing therapists and other professionals in the field. 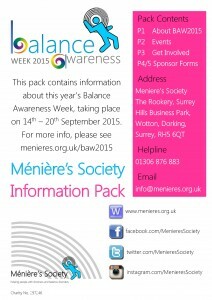 © Meniere’s Society Balance Awareness Week campaign pack. For the last few years we have been delighted to partner with Meniere’s Australia and the Vestibular Disorders Association (VEDA) in the US as part of a global effort to raise awareness and defeat dizziness. In our ‘BAW2015 Pack’, you’ll find suggestions of ways you can get involved with Balance Awareness Week 2015 and help raise the profile of vestibular disorders. Whether you’re a patient, health professional or know someone who’s affected, we hope you’ll take part. You can also download the Balance Awareness Week information pack by clicking on this image. 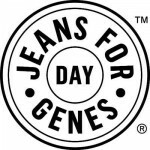 Several events are planned for Balance Awareness Week including Blue Monday where schools and businesses are encouraged to ask people to attend wearing blue clothes. There is a social media campaign set to run throughout the week called ‘Spiral Viral’. This aims to raise awareness for people suffering from dizziness and imbalance caused by a disorder of the inner ear (the vestibular). Your business can go further than simply asking people to arrive wearing blue on Blue Monday for Balance Awareness Week. You can use social media to promote information about Balance Awareness Week and if you work in the field of exercise, music, sound or use audio-visual equipment in the workplace, you could run events and awareness activities to help people understand the dangers of dizziness and how to protect your ear drums. For more information about supporting Balance Awareness Week or other awareness campaigns, email info@awareness.co.uk. We’d be happy to work with Bristol Marketing’s awareness day business marketing experts to help you find innovative and effective ways to boost awareness of the campaign as well as your business.